Dr. Laleh Gharahbaghian is an academic emergency physician who completed a fellowship in Emergency Ultrasound in 2007 at Stanford. She has remained on the Stanford faculty, now serving as Assistant Medical Director for Emergency Imaging and the Director of the Emergency Ultrasound program and fellowship. Dr. Gharahbaghian's interests include ultrasound in medical education, quality improvement, resident education, and simulation-based ultrasound training, including procedural skills training and case-based learning for ultrasound interpretation and integration. Her research involves the study of various point-of-care ultrasound applications in the management of critical patients, in the screening of trauma patients, and in its education through simulation models. 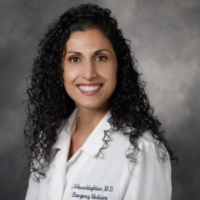 Dr. Gharahbaghian is a leader in the national bedside ultrasound educational impact, has lead several very successful educational innovations in emergency ultrasound, including her internationally-known blog, SonoSpot.com. She has co-directed UltraFest, a free national medical student ultrasound symposium at Stanford, and travels internationally to provide educational sessions on ultrasound applications and integration into emergency practice and rural village clinics. Dr. Gharahbaghian is the Co-Chair of ACEP's Ultrasound Section Newsletter that publishes interesting cases and topics in bedside ultrasound quarterly and is a Faculty Mentor in the Chief Resident and Fellowship Incubator for the internationally known Academic Life in Emergency Medicine group. While working in the emergency department and caring for her patients, she continues to be an advocate for social health, providing the highest quality of care, and ensuring that all patients and their family members feel assured that they are in good hands.